Homemade brown soda bread and honey butter: a good start to Christmas day. Soon to be followed by cheese, olives, chicken & andouille gumbo, crab dressing, brisket, more cookies than is right or proper, and chocolate malted cheesecake. 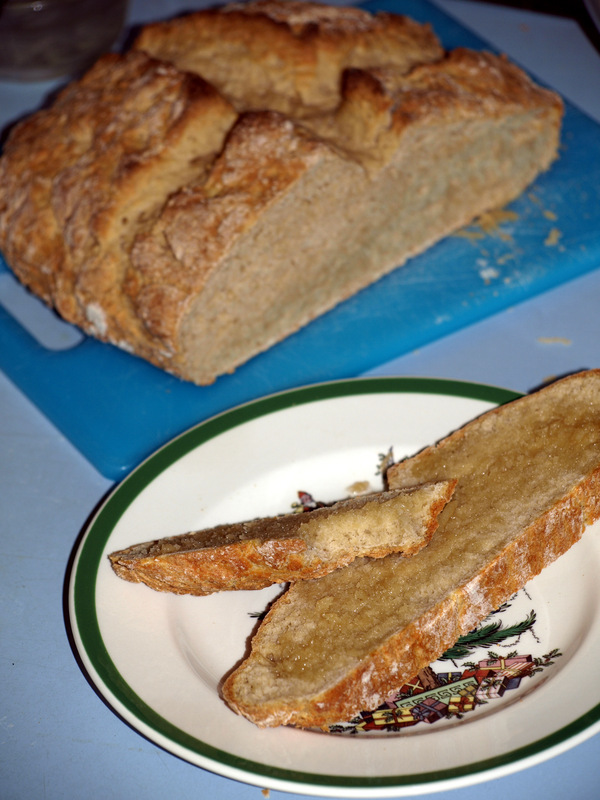 Find the brown soda bread recipe in Tim Allen’s Ballymaloe Break Book. Merry Christmas to you. May peace and joy be your dinner guests today. We didn’t bake bread all holiday season so far. We actually bought rolls…I feel so ashamed, ha ha. Hey, you can look to 2012 to amend your ways. LOL. It’s easy to stick a loaf of bread or pan of rolls into the Egg after you’re done with today’s entree…then you’ll have bread for later. No sense in wasting a preheated grill.